If the State is the new God, then California governor Jerry Brown is perhaps one of its chief prophets. The two-time governor, who has his own classic punk-rock song dedicated to him, is among the most mystical of the State's modern high priests. For Brown is a Zen master among politicians: mysterious, unfathomable, and unpredictable. Known for refusing the taxpayer-funded perks of being California's governor during his first reign, he nevertheless presided over the giant state's first-ever budget deficits. Later running for mayor of Oakland as an uber-Progressive, he then as mayor enacted business-friendly policies that would do a Republican proud. And despite his fame for being an "environmentalist", his gubernatorial reigns have been marked by environmental disasters including not one but two man-made droughts. Can astrology help crack the mystery? Dare we hope for illumination from the planets? Libertarian? : Pallas co-ruler Jupiter square the Nodes. Authoritarian: Pallas co-ruler Jupiter quincunx Pluto, which is trine the North Node. The Pluto connection gives us his heavy-handed tendencies. The Nodal square confuses the picture, suggesting the very real possibility of occasional rational behavior (possibly explaining some of his reign in Oakland). Collectivist: Neptune in the Second House, sesquiquadrate Venus and Second House ruler Mercury; South Node in Taurus. Brown's chart seems much more Left than not in terms of economics. The mixed Pallas signature above can mitigate this somewhat. Conservative: North Node in Fourth House, trine Moon in Cancer. Liberal: Moon in the Twelfth; Fourth House ruler Venus sesquiquadrate Neptune. Mixed signatures in the "culture" category tend to go to the "liberal" side of the equation. I suspect they may also correlate with environmentalism, but I haven't crunched enough data to be sure. Semi-authoritarian + collectivist economics + mixed culture -->; "moderate" Left-Liberal? The overall ideological signature does more or less match with what I know of his record. Extreme Neptune and Twelfth-House strength: Neptune and the Twelfth claim or connect to all the planets on this chart except Jupiter and Saturn. This would help explain Brown's famous mystical leanings. It might also explain his habit for making water disappear. While recent years certainly have seen nature turn down the tap, "shortages" can only occur when the State interferes with the rising prices that should naturally occur with resource depletion. In an unhindered market, there are no "shortages", only rising prices which are then nearly always mitigated by an influx of competing providers seeking to profit from said prices. Uranus conjunct Mars, ruler of Sun: This is about as unpredictable as it gets. Jupiter in the Seventh House in Aquarius: Brown dated pop stars in his younger days. Now he's married to a high-powered corporate executive. 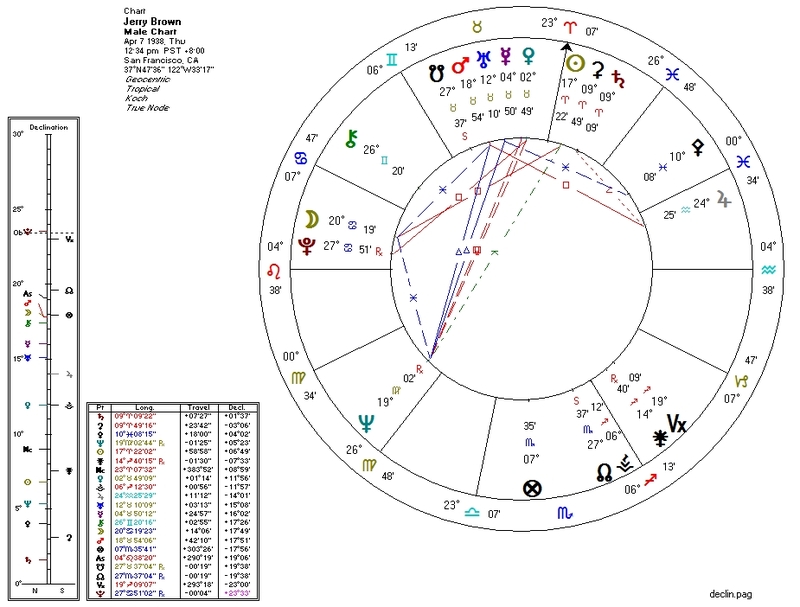 Chiron in the Eleventh, trine Jupiter, parallel Mars and Moon: public "wounding" perhaps relating to the large "dip" in power in the middle of his long political career? Brown's reign over California has been too eventful for my liking, but his rule over Oakland was not the worst thing to happen to this beleaguered city. Perhaps he can best be the "do-gooder" he aspires to be at the local level.